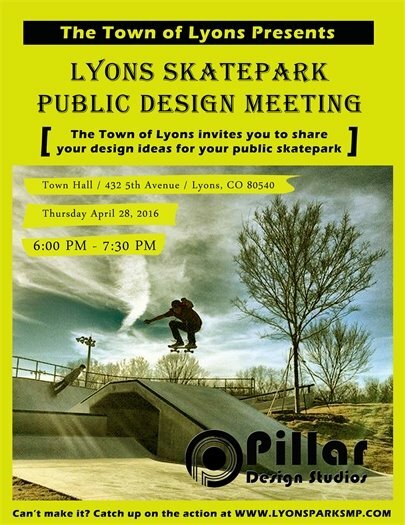 Please join us for the Lyons Skatepark Public Design Meeting, on Thursday, April 28. Due to mechanical issues with the contractor, the street sweeping has been postponed. Notice will be sent upon rescheduling. 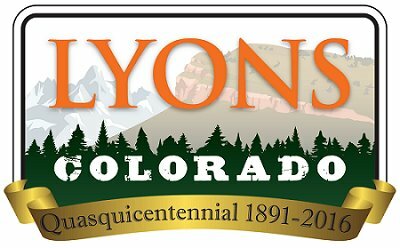 A public forum is available on the LPPA page on the Town's website, to allow feedback and ideas for the Lyons Primary Planning Area Master Plan process. Additionally, FAQs and the latest presentation materials from past workshops can be found on the website. This week, the teams began electric wiring for the street lights and the LED lights for the traffic signal. Weather permitting, the team anticipates completion of the drainage elements and to begin removal of the curb, gutter, and asphalt this week. McConnell Bridge has been designed up to 30% and is waiting for the drainage analysis signoff from FEMA. Upon FEMA's approval, the final design will be completed, and construction will be scheduled. The final design will include paving McConnell drive. Until construction for the project begins, the Town cannot fund interim paving. In the meantime, Public Works, Parks & Rec, and Town Engineers will continue to grade and treat the road with mag-chloride. Additionally, the Town is looking into other methods of maintaining the surface, including forms of patching and dust control. Please help maintain this road by driving slow and using caution. Your patience is greatly appreciated. The civil construction phase for the creek restoration project is complete, and revegetation and landscaping are underway. In early April, over a thousand willow stakes were planted along the creek banks. At this stage, the young willows are extremely vulnerable to damage - please allow time for the habitat to establish, by limiting activities in these environmentally sensitive areas. Following Spring run-off (expected June to August), crews will continue to revegetate the area with additional native plantings. Earlier in the week, the creek was stocked with trout in Meadow Park. On the advice of local trout experts, the fish will temporarily be fed natural fish food, until the aquatic habitat is reestablished. Please note that Meadow Park is still under construction and closed to the public. Thanks for your continued cooperation, as the trout get settled in their new habitat and the park continues to be built! The trail along US-36, between Black Bear Hole and 2nd Avenue is now open. Please stay on trail, as the surrounding area is still under restoration with new vegetation. The final report from the Parks Flood Recovery planning, which includes plans for Bohn Park, Lyons Valley River Park, and a comprehensive trail plan, can be found on the Town website. The Planning Process utilized existing Town planning documents, and incorporated information about proposed improvements, amenities, and facilities that were developed and accepted by the public. For the first time since the flood, the Parks and Recreation department has released a Recreation Brochure, for Summer 2016. The brochure includes information on events, programs, resources, how to get involved, and much more. In an effort toward sustainable practices, the full brochure can be found online, or picked up at Town Hall at no cost. On April 30, from 10:00 a.m. to 2:00 p.m. at the Boulder County Sheriff’s Office Lyons substation, the Drug Enforcement Administration (DEA), Boulder County Sheriff’s Office, and the Town of Lyons will be partnering in the DEA Drug Take-Back day. This will be a drive-thru drop off; just stop out in front of the substation by the tent, roll down your window, and a deputy or representative will take the items from you. Thank you to the nearly 200 people who attended our public meetings last week! If you were unable to attend the public meetings concerning the permanent repairs to US 34 in the Big Thompson Canyon, we wanted to make you aware of some important information regarding upcoming construction activities and associated traffic control options and invite you to offer input on these options. Please click this link for presentation materials. Click here to view all the materials from last week's public meetings. As you might imagine, in the interest of public safety, it will be necessary to close sections of US 34 when rock blasting work is done and the blasted materials are removed from the road surface. There are several ways to implement these closures, however, and we are looking to the people who live, work and travel through the canyon to provide feedback on the approach that seems worthy of further exploration. The initial segment of the canyon where this work will be done is between the former Idylwilde Reservoir site and Cedar Cove, and with the amount of rock that must be blasted and removed in this area (enough to fill about 10,000 dump trucks) there are two general approaches we can take with respect to controlling access through the east end of the canyon between Drake and Loveland. We can either provide more daily access between Idylwilde and Cedar Cove and spread the work out over a longer period of time (Option A) or we can implement more stringent travel limits between Idylwilde and Cedar Cove that enable this work to be done in a shorter timeframe (Option B). These general approaches, outlined on one of the email attachments, are just a starting point to initiate discussion. This is where you come in. We realize there are a number of things to consider when it comes to limiting travel through the east end of the canyon. How will people get to and from work? How will mail and packages get delivered? How will school buses get to school on time? How will propane and waste hauling companies get through? How will visitors get to local lodges and cabins? How will emergency service vehicles get through? We have already started looking into all of these issues but we want to make sure that we are not missing anything. At this point we need your comments and suggestions so we can further refine the initial options being presented at this time. While we most likely won't be able to accommodate every request and need, we can make adjustments to account for the public's primary concerns. What, if anything, are we failing to consider at this time? Please use the attached comment form to call to our attention factors that we might not have considered and provide your thoughts on the general options we are starting with so we can proceed with making adjustments. Please fill out this comment form and email it back to us by Monday, May 2, so the planning process can proceed. It should be noted that this is not a voting process where we are simply tallying the results across three categories to select the option referenced most. Rather we are trying to get a general sense from the community on which option is worth pursuing further and what modifications we need to make to make these options more viable. Also attached to this email is a handout provided at last week's public meetings that shows the travel distances and estimated travel times from various locations when it will be necessary to close sections of the canyon for rock blasting and removal work. You may also take this one-question poll by the end of the day on Wednesday, April 27. The results of the poll will be shared with CDOT.